The industry wide deadline for TLS 1.2 support was June 2018. Without the TLS 1.2 updates, you will not be able to process credit cards online. Please contact Execu/Tech Systems support to be sure you have the proper PMS and POS software updates to support the TLS 1.2 security protocol for credit card processing. Your computers may also need operating system upgrades and patches as well as installation of newer .NET frameworks from Microsoft. These steps must be performed on all computers that need to process credit cards. If your computers connect to a server using Remote Desktop Services (RDS), then only the server needs to perform these steps. If your computers connect to a server using RDS, you must check that TLS 1.2 is enabled for each Windows User that connects to the server. These settings are enabled per user in their RDS session. The following operating systems ARE NOT SUPPORTED! NET Framework 4.7.1 or newer must be installed on all computers where credit cards are processed. In a Remote Desktop environment, this includes the server. It may work with an older .NET Framework but this is the one we have tested and verified. Make sure your operating system is up to date on all updates. TLS 1.2 was broken by a Windows update and was fixed by a later update. Make sure you have all Windows Updates and the latest .NET Framework. We're not able to determine which update fixes the TLS 1.2 issue but tests on computers that have all updates as of April 5, 2018 are working properly. Make sure you install all available cumulative updates. Apply this patch from Microsoft. It's been tested on our servers and fixes the problem. Because we use tools provided by Microsoft to perform certain functions, we also rely on them to encrypt the data. In order to do this, you are required to install at least version 10 of Internet Explorer, though Internet Explorer 11 is preferred. 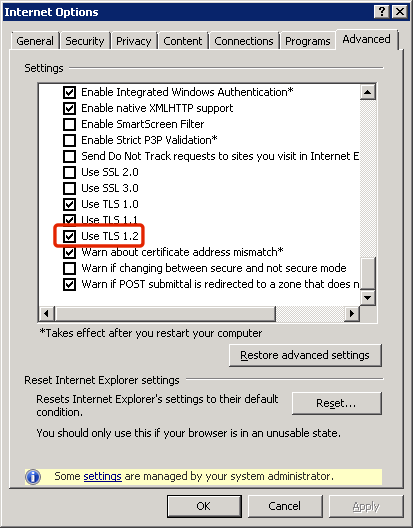 Since older, un-patched versions of Internet Explorer 10 do not enable TLS 1.2 by default, the following link contains information on enabling it. Failure to addresses these issues will result in interruptions of your electronic credit card processing interfaces. We apologize for any inconvenience but this is not an Execu/Tech requirement, this is an industry requirement.Older encryption protocols have been compromised and the new protocols are necessary to ensure the security of customer cardholder data. To help you determine if your computer is able to use TLS 1.2, we've created a simple utility that will tell you. Any errors will be shown. This tests both your Internet Explorer compatibility and your .NET Framework compatibility (which may or may not work depending on windows updates and patches). If there are any issues detected you might see a warning like this. Please verify that .NET Framework 4.7.1 or newer is installed. Clicking OK will show you this screen. If Internet Explorer is up to date then it will likely pass the test even if the HttpWebRequest Method test fails. In this image you can see that the .NET Framework that's currently installed is 4.6.2 so an upgrade is necessary. Even though the .NET framework might not be the latest version and should be updated, you might also need to do some Windows updates so check that as well. If .NET Framework is up to date and you have Windows 8.1 or Server 2012 R2, you should install this Microsoft patch. If everything goes right you will see the following image. Customers with an OTA / HTNG Reservation Interface (Travelclick, Synxis, Vertical Booking. etc.) must check with the appropriate vendor to determine the TLS cutoff date. They may require TLS 1.2 on your server to continue reservation delivery. If you are a Cloud Hosted customer there is nothing you need to do because we take care of this. Instructions for enabling TLS 1.2 can be found here. We spent quite a bit of time searching for a solution to this and were unable to find definitive information in one location, so we put it together on this page. If you're a software developer and came here hoping find out how to implement TLS 1.2 in Microsoft .NET 2.0 assemblies or applications, these instructions may work for you. 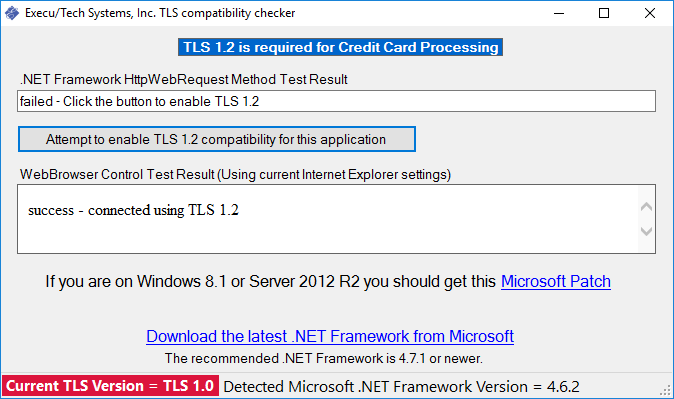 The compatibility checker is written using the .NET 2.0 framework so it will show if your computer is ready to support TLS 1.2 from a .NET 2.0 application. 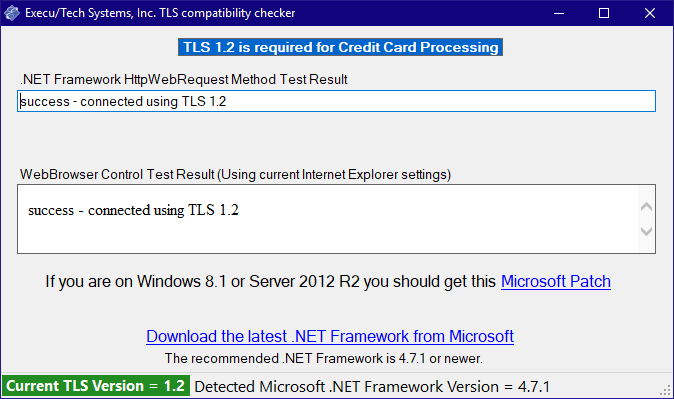 After installing the latest .NET framework and applying any necessary patches on the computer, this is the code to implement TLS 1.2 in a .NET 2.0 assembly or application.